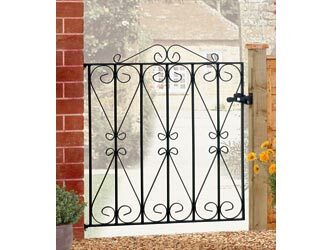 A solid steel constructed 20mm x 6mm frame with 10mm diameter infill bars 10mm x 3mm scrollwork. Height 3' 0" and fits 2' 9" - 3' 3" opening. Supplied with a universal latch for left or right hand opening and fixings for timber, brickwork or steel posts. Supplied primed black but will require a further coat of good quality gloss paint.